The US savings rate has been declining for 15 years, from 8% in 1992 to -0.5% in 2007. Many analysts and policymakers have expressed concern about the decline in the personal saving rate. A major concern is whether the US households will be able to provide adequate long-term needs, such as future retirement and medical expenses. Personal saving are also used in times of an economic downturn to buffer the effects of loss of income and higher prices. But if savings are so important, then why haven’t there been any noticeable problem with our declining saving rate? Why has the nation continued to boom for a decade or more while personal saving rates have declined? A glowing economy needs lots of money for personal consumption and for capital expenditures and investments into factories, industrial equipment and commercial property. The money that has fueled the booming economy for the last decade came from two sources. First, the Federal Reserve monetary policy has helped flood the market with money by way of lowering the interest rates, which were as low as 1% for an entire year in 2003. Second, many foreign nations have much higher personal saving rates and that money pored into the US by way of US Treasury Bonds, Stocks and many other equity instruments like real-estate packaged debts. These two sources have provided the funds needed to meet the consuming demands of the last decade. 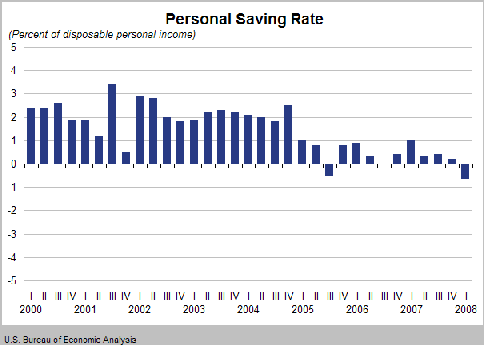 While the money was readily available and the economy looked invincible, personal savings continued to drop. Modern economic thought suggests that saving and consumption are highly dependent on expectations about the future. As the current economic downturn progresses and more people start to worry about the future of their jobs, personal savings is bound to increase as consumption decreases. This is all well and good, but if the economy turns down too fast it could create hardship as there are no personal savings to draw from. The Fed is already doing all it can to push money into the system, with low interest rates and tax rebates. Yet, the economy is reeling because the housing market has completely pulled the rug out from under the consumer. The last place the consumer had to look for money is their credit cards, which it why many people who are in financial trouble are now living on their credit cards as a last resort. Inflation is about the ruin the party, because in the last several recessions the strong demand for the dollar – lead by the momentum of globalization – allows the Fed to hold the interest rates low, while attracting foreign investments to pore into the country. Inflation is about the ruin the party, because today inflation is already higher then the interest rates. Many economists believe inflation is closer to 8% while the bank-to-bank interest rates are at 2%. This situation is increasing prices around the globe and is leading foreign investors away from the US as they do not want to invest in US Treasure bonds with interest rates lower than inflation. Inflation is going to force the Federal Reserve to start increasing the interest rates. But, to protect the economy from further deterioration, the Fed is likely to talk up their interest rate increases more than they actually plan to increase them. If interest rates are not moved above inflation, the dollar will continue to weaken as foreign investors reduce their investment positions and local investors move their money into foreign markets. At some point in next few years, the government could start putting restrictions of the number of foreign assets that can be purchased in order to try to protect the dollar from further deterioration. Savings are essential to the economy as the dollar continues to fall because businesses need capital to grow, which they get from savings. The savings rate needs to help the economy and support the dollar, but who wants to put money in the bank when the interest rates are lower than inflation? The lack of personal savings could create a major credit crunch for the US economy in the very near future. The government is left with very few choices. They can printer more money with bailouts and low-interest lending auctions like they have been doing, but these things only add to the inflationary problem of increasing prices and push the dollar towards hyperinflation. They can create new regulations like wage freezes, price controls and limit the amount of dollars leaving the country, but these things have historically never been successful and people continue to find creative ways around this controls to protect their wealth. They can increase the interest rates above inflation, which will increase the money supply by increasing savings, but it will also push housing prices down and further burden the consumer which will slow economic growth and likely run the economy into a full-blown recession. This is the best decision, but it is also the least likely decision to make for elected officials that are concerned about their own jobs. The decrease in personal saving rate in the US over the last decade could put the US through a very difficult economy period. The lack of personal saving will be a lesson learned that will not be easily forgotten, just as my grandfather never forgot what he learned during the Great Depression. Personal savings are very important.